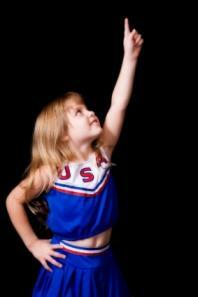 Little cheerleaders can start as young as preschool! Since cheerleading has become such a competitive sport, it is more and more important for little cheerleaders to start learning skills at a young age. Cheerleading classes and squads now start as young as preschool age at some gyms. Parents should take into consideration the costs associated with the sport and whether or not their son or daughter really enjoys the classes. However, if your child has some natural ability and really loves taking dance, cheer and tumbling classes, he or she may go on to become a cheerleader in high school and college. Some kids even earn small scholarships to universities around the country. There are a few basic skills that children can begin learning as young as age two. For example, many parents put their young sons and daughters into a Mommy and Me class at a local gymnastics school. These Mommy and Me classes begin teaching basic stretching and tumbling skills that will become vital to cheerleading later in life. The classes are fun and Mom (or Dad) can help the child with front rolls, stretching, splits and other exercises. Instructors usually try to introduce children to the trampolines at a young age to teach bouncing skills and build leg muscles that cheerleaders will need later on to perform jumps and flips. Stretching is also vitally important to lengthen the muscles and help with the ability to do bends and splits. Flexibility is very important to successful cheering, and it's never too early to start learning these skills. Many of the things learned in these classes can be repeated at home to strengthen skills and ability even more. Once a child has mastered the basic gymnastic skills necessary for tumbling, it is time for true little cheerleaders to take cheer classes . About half of the gymnastics schools in any given area offer beginning cheerleading classes for children around four or five years of age and up. These first cheerleading classes consist of three main components and often meet once or twice a week. Basic stretching, muscle building and conditioning: Students learn how to stretch into the splits and perform tiny leg lifts, butterflies, sit ups and crunches. Tumbling skills such as round offs and handsprings: These are best learned with an experienced coach who knows how to spot students and avoid injury to student or self. Any parent that has ever tried to spot their child while he or she is doing beginning cartwheels will tell you that you're likely to get kicked in the face. Cheer techniques, such as voice, arm positions and movements: Cheering is about more than just being peppy. There are specific positions in which the arms should be held for optimum cheering. Also, many of these classes teach the different cheerleading jumps, such as a Herkie. As children grow older, many gyms move the students into competitive cheer squads that meet four to five times a week for several hours and travel to cheerleading competitions around the country. These classes can grow costly, so some parents opt to let their sons and daughters try out for the school's cheer squad at this time to save a little money. Other parents keep their child in the gym's classes. This is really a personal decision and may also depend upon whether or not the school has a cheerleading program. Many of the cheer competitions for young cheerleaders are hosted by gyms around the country. The winning squad often receives ribbons and a nice trophy for their gym, plus the accolades of other students and parents at the gym. As students grow older, many move into more intensive competition and can win scholarship money and other prizes. Whether a child simply cheers for fun or goes on to more competitive cheerleading, the skills and conditioning of this early training will stay with him or her for life.